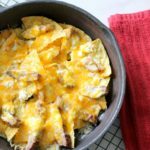 These Skillet Fajita Nachos with Chicken and Steak is the perfect Taco Tuesday appetizer or meal! Heat oven to 275. Layer the bottom of the skillet with tortilla chips. In a small bowl, soften the butter in the microwave for about 20 seconds. Stir until fully melted. In a small bowl, soften the sour cream in the microwave for about 20 seconds. Stir until melted. Place the chicken and steak fajita meat onto the nachos. Carefully drizzle the butter and sour cream over the nachos and meat. Cover with cheese and place in heated oven for 10 minutes, or until the cheese is fully melted. Consider adding additional toppings such as guacamole, salsa, and more. This recipe is quick and easy if you use pre-made chicken and steak fajita meats. Dip the nachos in your favorite salsa.